The Ministry of Trade, Industry and Energy(MOTIE) and the Ministry of Employment and Labor(MOEL) on January 18 jointly issued a press release simply composed of four sentences. The statement contained that a ‘special occupational safety investigation committee’ led by Prime Minister will be set up to analyse the reasons of serious industrial accidents of the coal-fired thermal power plants, among others. It also announced a plan to discuss the permanent employment of contingent workers who are engaged in the work handling fuels, operation of environmental facilities and regular repairs in the thermal power plants. 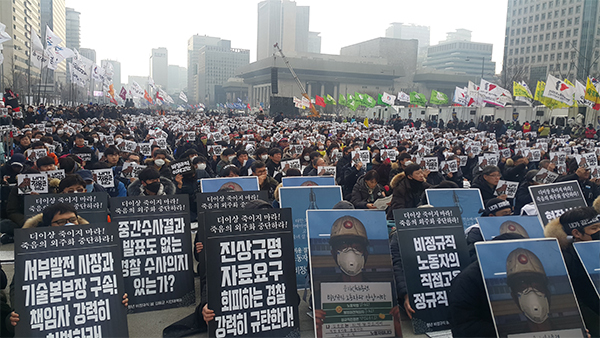 It was a government response to the demand of a civic countermeasures committee for the late Kim Yong-gyun, a 24-year old contingent worker who was found dead at dawn while on his duty to check the operation facilities at the Taean Thermal Power Plant on December 11 last year. The government, however, did not mention about the measures which deemed essential to prevent the recurrence of accidents such as the punishment of those responsible for the accident and the suspension to the outsourcing of harmful and hazardous business.